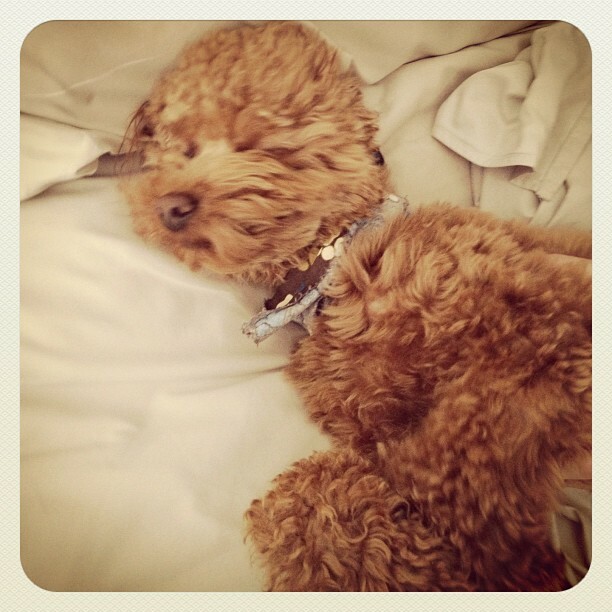 Yes, he is very spoiled and sleeps in our bed. He is, however, not allowed in the sheets and decided to take my spot after I got out of bed this morning. Oh well. Sometimes, he’s just too cute to move! I have to share our great dinner last night. We rarely go out to eat two nights in a row, but there was a great deal and the wait was too long for this restaurant on Friday night when we first tried to go. 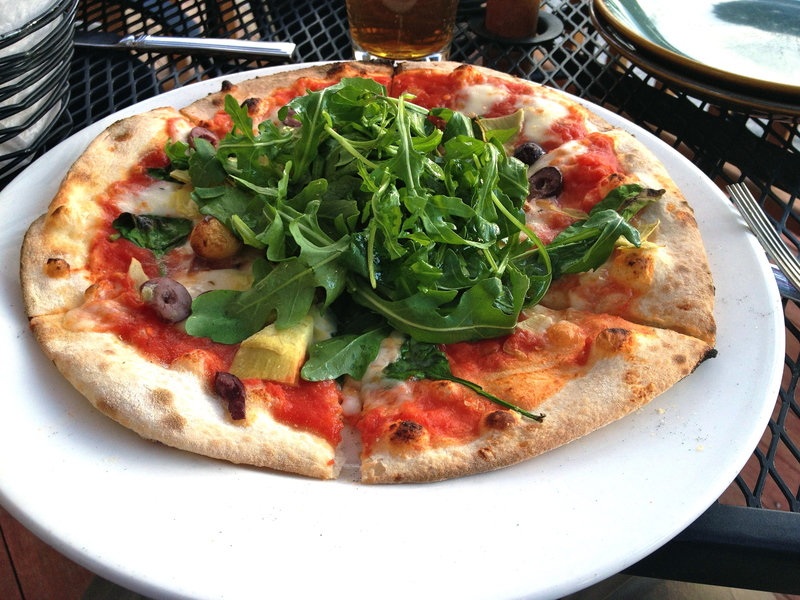 We went to 900 Degrees, a local pizza joint known for their wood-fired pizzas, and we each got a starter, a pizza and a dessert for only $15. They definitely make the best pizza in Manchester. It was also a beautiful night and we got to eat out on the patio. 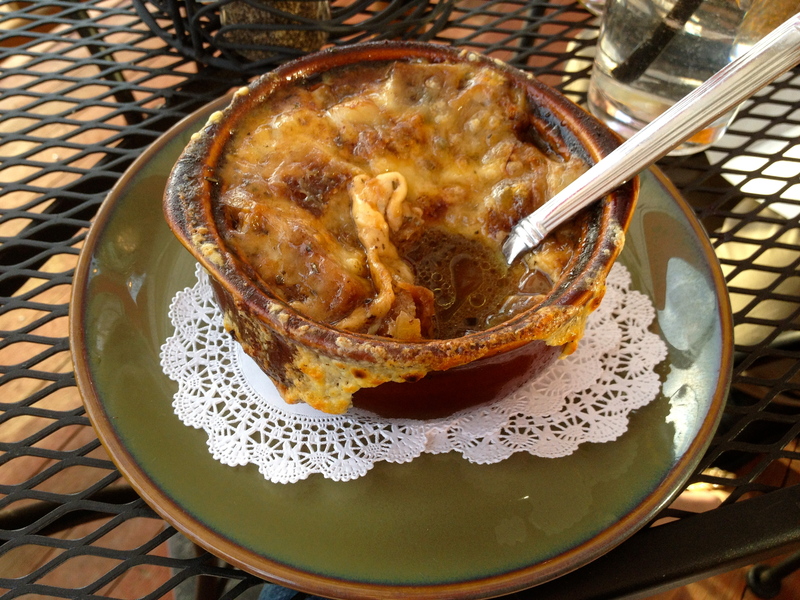 I started off with a delicious french onion soup. 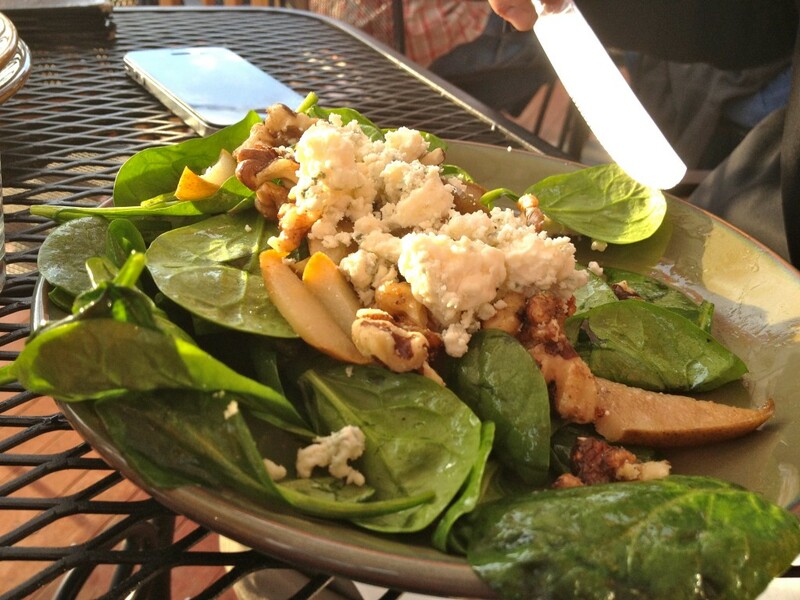 And Luke started with a spinach salad. 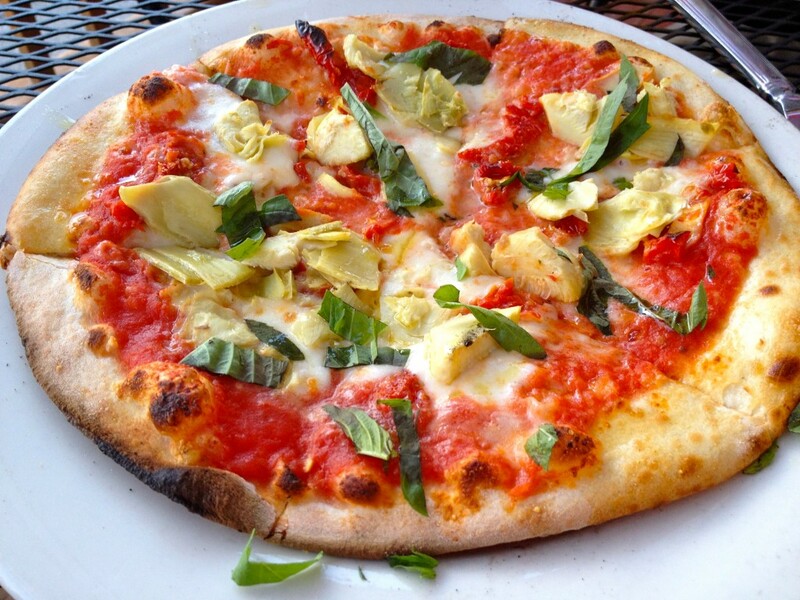 Then I had the “Tuscan Sun” pizza – tomato sauce, Grana Padano, fresh mozzarella, artichoke hearts, sun-dried tomatoes, fresh basil and extra-virgin olive oil. It was very good! And I ate the artichokes! Luke had the “Donatella” – tomato sauce, mozzarella, roasted garlic cloves, kalamata olives, spinach, artichokes with fresh olive oil to finish. I didn’t sample it because I am not a fan of olives, but Luke loved it. 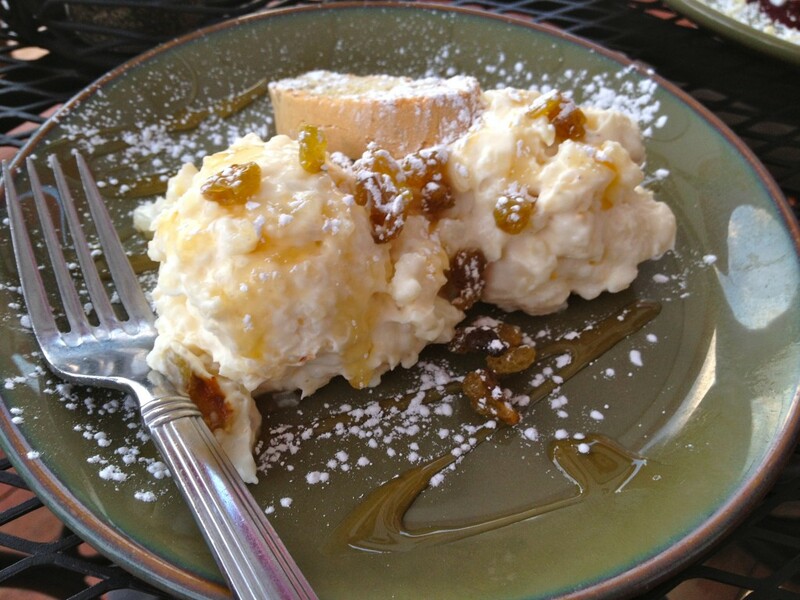 Finally, for dessert I had the “Venetian Rice Pudding” – imported Italian Arborio rice simmered with milk, cinnamon sticks, vanilla bean and orange peel and finished with a drizzling of local honey and sprinkling of golden raisins. 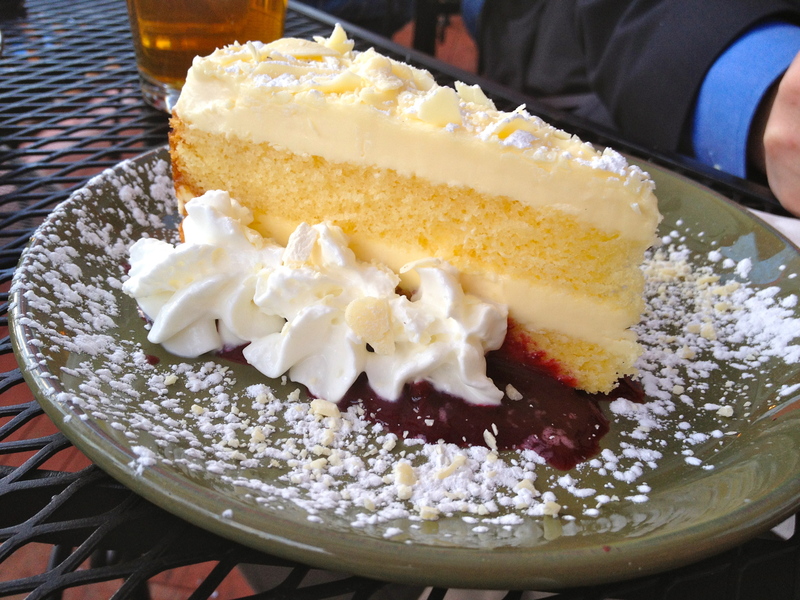 And Luke had the “Lemoncello Torte” – which I can’t find the description for but it was delicious too! Neither of us had room to finish the desserts, so we brought home a few slices of pizza and most of the desserts. Overall, it was a very tasty meal and quite the bargain for $30! 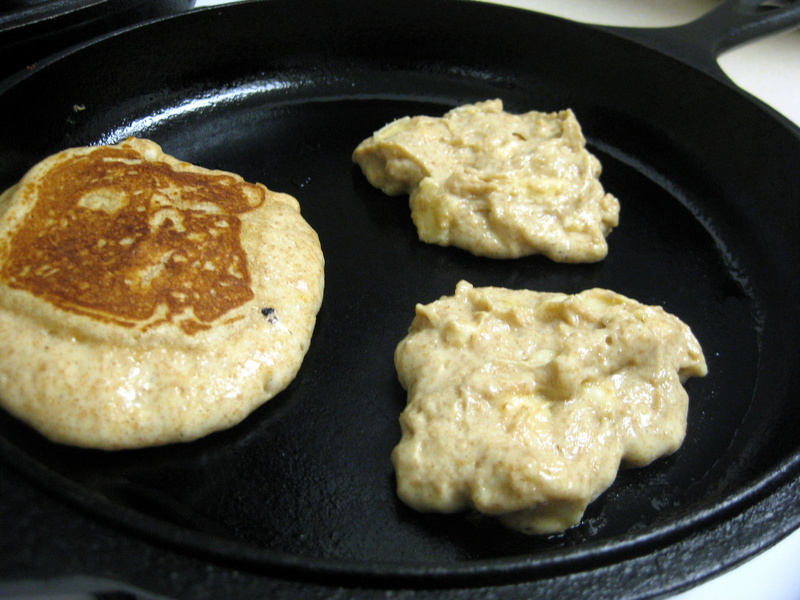 Moving on to breakfast this morning – Whole Wheat Banana Pancakes! 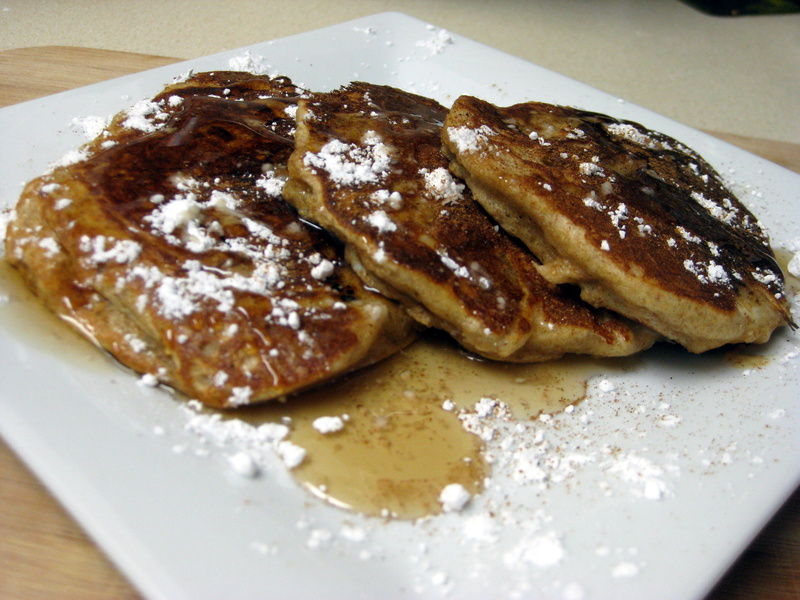 This is another variation of my Apple Cinnamon Greek Yogurt Pancakes. I used vanilla Chobani instead of apple cinnamon and threw in some chopped bananas and a little vanilla. They are so easy to make and perfect for a lazy Sunday morning! Just mix together your dry ingredients. Then stir in the yogurt, egg and vanilla. Add the sliced bananas and stir again. Cook on an oiled pan over medium heat for a few minutes on each side, until cooked through. 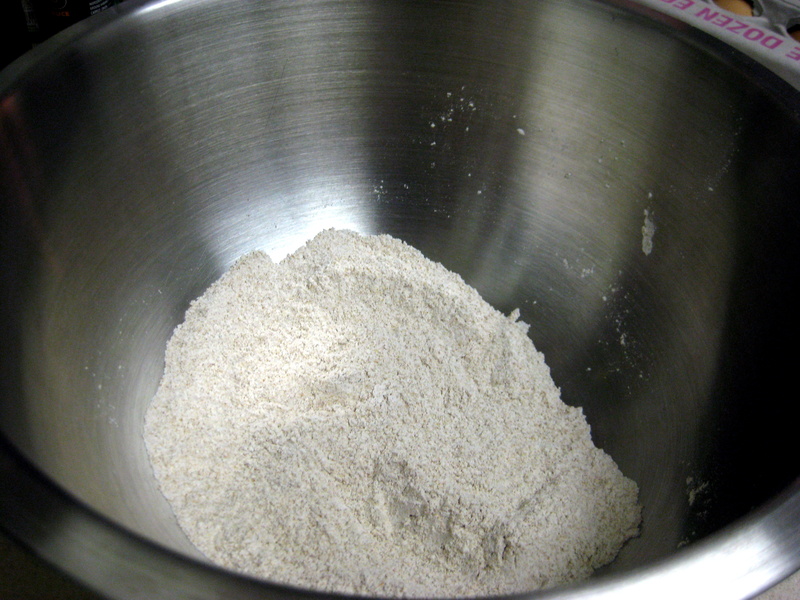 Mix together the flour and baking soda in a mixing bowl. 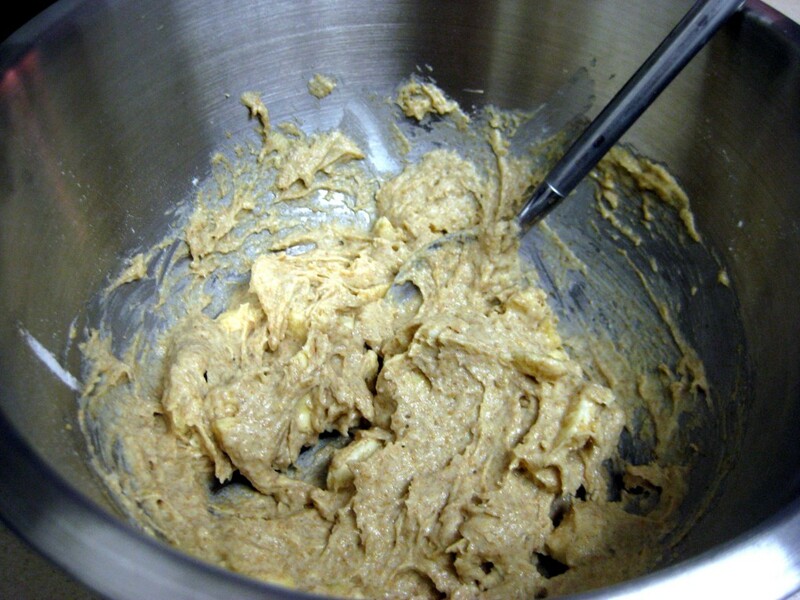 Slice your banana into small pieces and add it to the batter. Stir until combined. 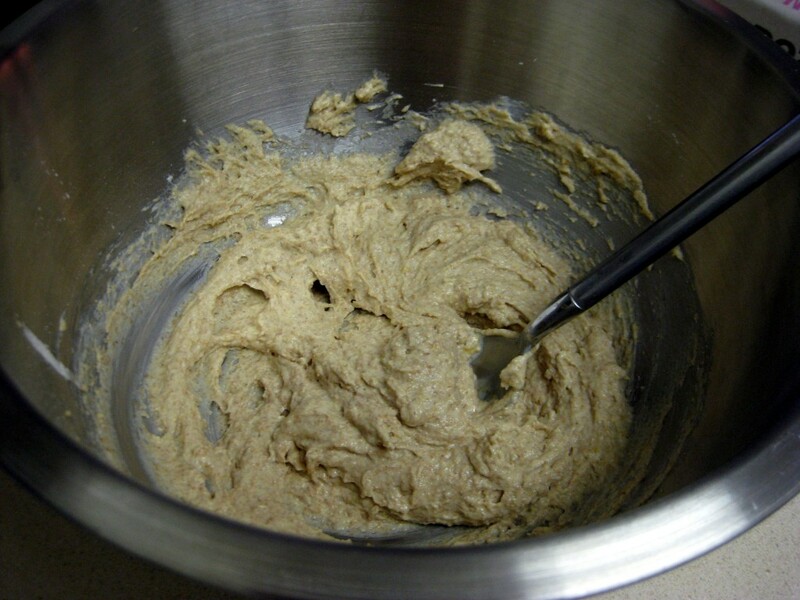 Heat an oiled pan to medium heat and spoon the batter onto the pan. Cook for a few minutes on each side, flipping every now and then to prevent burning and ensure the pancakes are cooked through. 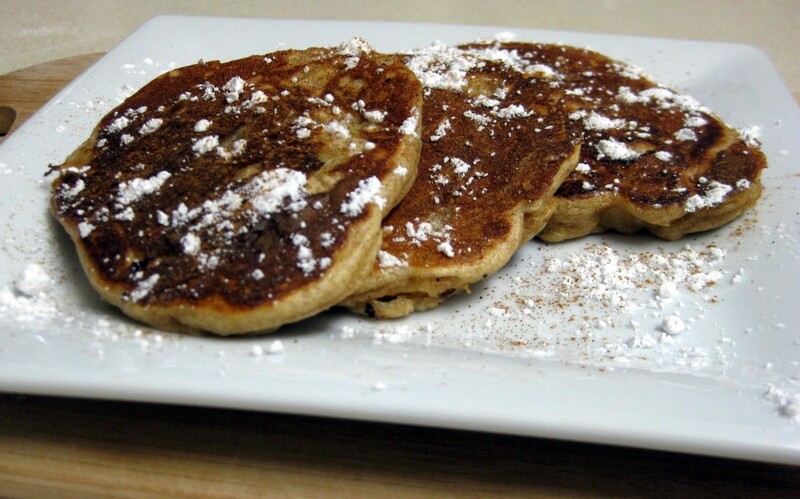 Top with maple syrup, powdered sugar and cinnamon (optional) and enjoy! This entry was posted in Breakfast, Pancakes, Recipes, Restaurants, Teddy and tagged banana, pancakes, pizza, restaurants, teddy. Bookmark the permalink. I love French onion soup. That one looks delicious! And that rice pudding! Oh my gosh! YUM!